i know everyone else discovered and made the walk-away dress a few years ago, but i somehow missed that. so when someone mentioned it recently in a discussion of 1950s dress, i instantly thought, "want!" even though most of the discussion was about how it's a terrible, terrible pattern that no one should waste their time on! somehow, that kind of talk made me want it even more. my dress would be different and better than anyone else's, simply because it's mine. logic, right? first i did a lot of googling. a lot of people have made this dress. many zillions of people have blogged about or made this dress. many, many, many. 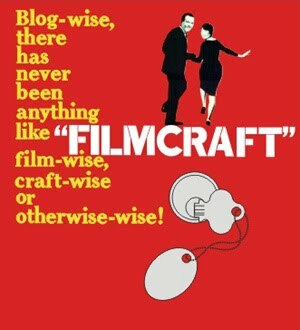 it was even featured on the great british sewing bee. but a lot of the dresses i looked at... well, i could see why they weren't happy. they had used a fabric too heavy, or drapey, or without enough body. they weren't fitted through the waist. their bust darts were pointing the wrong direction. they had made strange choices for alterations, but blamed the original pattern rather than the changes. or, they just didn't have the right figure for the dress. in the 1950s, a tiny waist held in by a girdle and uplifted bosom was the order of the day. this pattern was designed for that figure - it won't work on someone who is more straight up and down, even if it's twiggy. 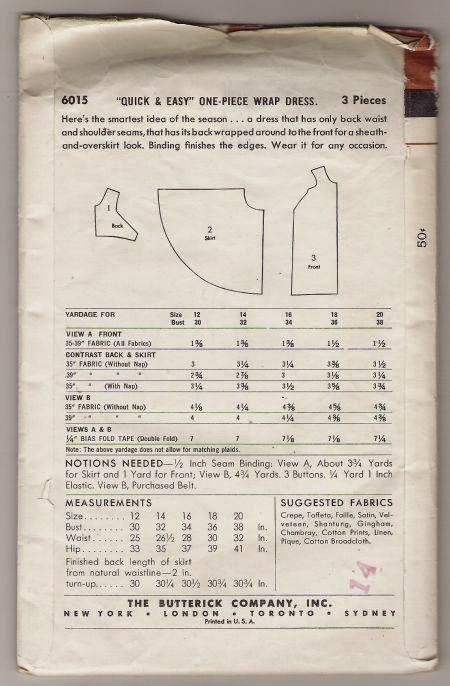 also, the "revised for modern figures" pattern butterick 4790 made some unfortunate changes, as you can see if you compare it to the original butterick 6015.
you can see the sides are distinctly angled on the original, but are straight and then curve on the new one. this gives the bodice less structure and support. 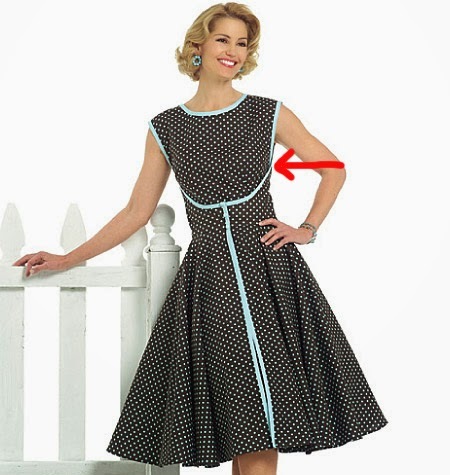 even on the pattern company photo of the new version, you can see it comes down weirdly low under the arms. the bodice looks loose and bunchy in spots too, and the waist isn't snug and sits too low. how to "fix" these errors by butterick has been heavily documented on the blogosphere, with helpful tutorials. 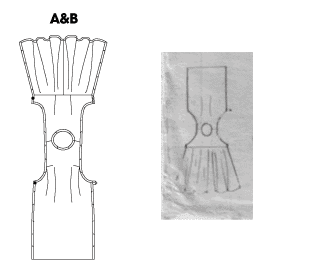 here's a linedrawing of the original pattern layout - this is what i will be aiming for! today, i bought the pattern. now, i'm keeping my eye out for a nice cotton poplin or chintz or even ticking - something springy, but with tons more body than the quilting cotton so many have used. 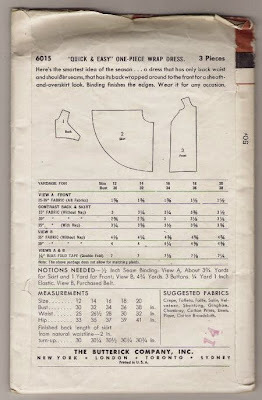 i was kind of astounded to see the pattern itself recommends "lightweight broadcloth." are you kidding? that would be a mess! and it needs to be inexpensive, because i need 4.5m of fabric. i need to find a day when i can spend some time down around queen street, preferably at king textiles i think. may take a while to find just what i'm looking for, but at least the sewing itself only takes a few hours! we have watched a lot of movies (and tv, and cartoons, and who knows what) over the course of the recent sickness. too many, even. actually, mostly it was the kid watching movies, with me trying to ignore them. but we did watch paddington together. they really tried, with this one. it looks gorgeous, all-star cast, a zillion cameos (including almost the entire cast of horrible histories, it seemed), a ridiculously evil villain and wildly dramatic plot, and so many zany, quirky, whimsical touches, it made me want to scream "stop with the whimsy already!" gratuitous carousel horses as decor! flowering trees painted on the walls! teapots that doubled as model trains! there's even a quirky group of street musicians - just about the only non-white people in the film - that pop up here and there to contribute to the "fun" atmosphere. just stop. one of the big focal points of whimsy was the mother, mrs. brown, played by the lovely sally hawkins, dressed like the middle-aged version of the most manic manic pixie dream girl ever. but i must confess, i did like some of her clothing. i just wouldn't have worn it all at once. here, she's wearing a flowered tie-neck blouse, red cabled sweater, and heavily embellished cardigan. is it really that cold? production design is important. wes anderson is the obvious master of sublime production design - but it is always in support of the story. it never takes over. paddington must have been so much fun for the set decorators and wardrobe (they reeeeeeally love knitwear) and props. it's almost as though a bunch of designers got together and came up with a "look" and then looked for a story to prop it up, and chose paddington somewhat at random. a classic, a longtime favourite, it's actually surprising it took them this long to get around to it. only, i kind of wish they hadn't, in a way. unsurprisingly, director paul king has some tv credits behind him (he's a mighty boosh alum), but not much else. i dimly remember his only previous feature - bunny and the bull - as being so whimsical we were unable to finish it. there's a certain vein of "but the english are supposed to be eccentric, the more eccentric the better" that sometimes pops up in both film and tv, and generally leads to massively self-indulgent and unwatchable absurdity. meh. still, i have some red yarn in need of a project, and i think i might make this hat (one of at least five hats she wears in the film). and i can see making this cardigan for the kid at some point (i was actually cahrting up a different squirrel the other day). but i won't expect him to wear it over two pullovers in the bath. i am really pleased with how it turned out. love the neckline, and the waist shaping. i do wish the sleeves were maybe 3/4" longer. and if you look closely, you'll notice the bottom button is missing, because i could only find six (i'm sure i have more of these somewhere!). but i wanted to wear it, so i'm calling it done! i also finally finished another silly project. i made a pair of farinelli gloves out of shibui sock, and destashed the leftovers during last year's purge. set them aside for the summer, waiting for glove weather. then the fall came, i tried them on, and realised... one thumb was shorter than the other! too short! how on earth did i do that? and i had already gotten rid of the rest of the shibui. fortunately, i had entered them in the fenelon fair, so i knew i had at least a scrap of yarn somewhere, as you need to attach samples of materials. but where? over the past however-many months, i have variously had my hands on the scrap or the gloves, but never both at the same time. today i finally had both! but couldn't find my 2mm dpns! knowing it was a tiny amount of knitting, and that the needles would turn up as soon as they were no longer needed, i decided to get creative and break out the toothpicks. annoying, but it worked in a pinch. and i found the missing dpns right after (and put them away properly in my needle roll). also managed to complete another dishcloth for the ontario food bank dishcloth-along. finally, i pulled out the mystery yarn (i have way more than i thought!) that my brother-in-law gave me for a birthday present, and started a little something. does anyone recognize this yarn? again, i am not getting to try my hand at macarons due to sickness! the kid is in a misery, so i am baking something wholesome and healthy and high in fibre - red river cereal bread. while it was rising, i finished my cardigan! originally i was thinking full-length sleeves instead of 3/4 - even though i always push full-length sleeves up and out of the way - but i didn't have quite enough yarn. so i tried making the second sleeve a smidgen shorter, and it worked for me! i only had to rip and re-knit about 16 rows, and it's a good thing i didn't try to make them any longer - i finished with barely inches to spare! here's a crappy snap - needs buttons and blocking, but you can get an idea of the shape and scoop neckline. i like it! ... and my loaves are a little uneven. whoops. i washed and blocked the cardigan while the loaves were rising. pretty productive morning, considering i'm tending a sick kid. and after all that work, we were both ready for a snack! combine cereal and butter. pour boiling water over. let sit 20 minutes. stir in whole wheat flour and 1 cup of the white flour. stir in yeast, sugar and salt; then molasses. work in remaining flour gradually. knead 10 minutes. place in a greased bowl, cover and let double (about 45 minutes to an hour). punch down, cut in half, knead each portion lightly, shape, and place in greased loaf pan. cover and let double (about 45 minutes to an hour). bake at 400f for about 30-35 minutes. so many plans for this weekend! i wanted to try macarons finally, and make cinnamon buns, and do some sewing, and go for a hike now that spring is finally here and it is possible to go outdoors. the kid and i were both hit at 5 o'clock friday morning. and that was that. we arefeeling a little better - no more vomiting - but still queasy, with sore achy legs. getting up the stairs is an insurmountable chore. ... and decided to avoid them. i ended up making a simple, old-fashioned vanilla pudding - easy to digest, but with some easy calories and protein to replace what we've been missing. and egg yolks are full of trace nutrients, so that helps too. after looking at a bunch of recipes online, i went with the one from chow (martha stewart's was basically the same - but with twice the sugar and twice the cornstarch? blecch!) i think the word "easy" in the title kind of sold me. i don't know if it's the cure, but it was a lovely afternoon break with a pot of tea! and now i have more egg whites for macarons. next week, maybe. i also got a fair amount of work done on the sleeves of this cardigan. the question remains: will i run out of yarn? it's awfully close! i don't want to buy more, although my brain is already cooking up ideas for what to add to the order to get it up to the "free shipping" amount. needs blocking obviously, but i'm pretty happy with the neckline. combine sugar, salt, and cornstarch in a small saucepan. whisk in 1/4 cup milk, whisking till smooth. beat together egg yolks and remaining milk, and stir in. cook over medium heat, stirring constantly, until it starts to thicken. remove from heat; beat in butter and vanilla. beat till smooth. strain into 4 individual ramekins. top with plastic wrap and chill 2 hours, or until firm. what a glorious weekend! we spent about half of it outdoors - there was an epic neighbourhood snowball fight - and half of it indoors. baking! and something i haven't made since i was a kid - butterscotch brownies! they were so very very good that i'm certain we'll be making more soon. 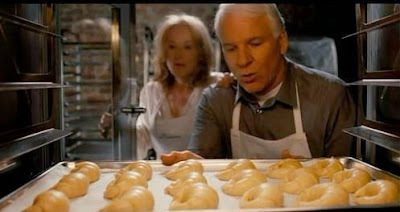 or, to be more precise, we started making croissants. because they take a fair amount of time, including an overnight rest before the final rise. i used to make croissants on a semi-regular basis, but it had been a long while. the dough was lovely to work with, so lovely and silky! it's hard to see, but i brushed the centre of the circle with a little milk, in order to help glue the points in place. when i used to make these, back in the day, i remember them unrolling as they puffed up in the oven! the milk trick worked, thankfully. ... but puffed up nicely after an hour. so tasty! so flakey! so doing this again! mix 3 tsp of the liquid with sugar and yeast and leave to sponge for 15 minutes. sift together flour and salt, and rub in 2 oz butter. cut the remaining butter in small pieces. add frothy yeast to remaining liquid and mix into flour. knead for 10 minutes. roll into a rectangle about 10" x 20". dot 2/3 with half the remaining butter. fold dough in thirds, encasing the butter. rotate 90 degrees, and roll, butter, and fold again as before. fold again, then rest in the fridge for an hour. roll and fold twice more, then let rest overnight in the fridge. the next day, divide the dough in two. roll each piece into a large circle, turn over, and cut into 6 wedges. roll each up from the outside to inside, brushing milk on the point to help stik it in place. curve into crescent shapes, place on greased sheet, and let double in a warm place. brush with a mix of beaten egg and milk, and bake at 350f for 25 minutes.